Unless you're taller than average yourself - eventually you are going to find yourself matched up with someone you literally have to look up to. Boxing a taller opponent has some unique challenges. The tall opponent will usually have a significant reach advantage, longer legs, and a target area that is not where you are used to hitting. What does that mean for you and how do you deal with it? The longer arms of a taller opponent means you are within his striking distance before he is in yours. Chances are he knows this too. I don't want to generalize too much, but tall fighters can easily adopt a boxing style where they keep their distance and pick off their opponents from the outside simply because its advantageous to do so. If you think you're going to keep your distance and let him come to you - you might as well quit before you get punched in the head too many times. That is the worst thing you can do. You're playing to his advantage - he'll just maneuver around you and pick you off whenever he gets close enough. You'll never be able to hit him. Don't play his game - make him deal with yours - maintain the initiative. Bring the fight to him. That means you are going to have break through his defenses and thwart his counter-punching to get up close and personal. Once you do get inside - STAY THERE. You are probably going to take a few shots every time you attempt to get inside and possibly even more when you get back out again so the best thing you can do is stay in close where you nullify your tall opponent's accuracy and power. Inside fighting is an art form of its own. Once you are there, condense everything and stay as close to the body of your opponent as you possibly can. It doesn't hurt to put your forehead on his chest to gauge the distance and then punish his body with short, controlled combinations. Your guard has to be super tight - do not expose any vital areas. Keep working and when you can't work anymore, either clinch or explode out of the danger zone. It is absolutely necessary that when you do decide to go to the taller opponent that you do it with authority and decisiveness. Do not hesitantly walk towards him -- explode into him, push him back, corner him and punish him. Do not go in on a straight line, but rather duck, weave and whatever else you can do to give him the fastest moving target he has ever seen. ​All forms of defense against the jab - but become a master at catching, blocking, or parrying the jab as you move forward. You will have to figure out a way to use his jab in your attack. Consider it punch number one of your combination. Body work - hooks and uppercuts that are short, controlled and fierce. Each one must be delivered from within. Best way to practice is to put your head on the heavy bag with a slight pressure as if you were pushing your opponent backwards with your forehead and then unload. If you aren't unloading, cover up but do not let the distance grow. Clinch if you have to. Inside you are relatively safe against a taller opponent because you use the length of his arms against him. Leg work. You need explosive power in your legs in order to get in and out. Work the plyometrics and practice any type of explosive leg movement such as jumping squats, burpees, bounding, half crouch heavy bag sessions and so on. All forms of defense against the jab - but become a master at catching, blocking, or parrying the jab as you move forward. You will have to figure out a way to use his jab in your attack. Consider it punch number one of your combination. Ducking and bobbing - especially moving forward. Picture the tall guy throwing a jab and how you would counter it and move in. Picture him throwing a right cross and how you would duck, sidestep and arrive at your destination. Picture a hook and the bob and weave you do to make it miss its intended target and position you where you need to be. Practice a strategy for dealing with each type of punch so you have a plan ready to go for each situation. 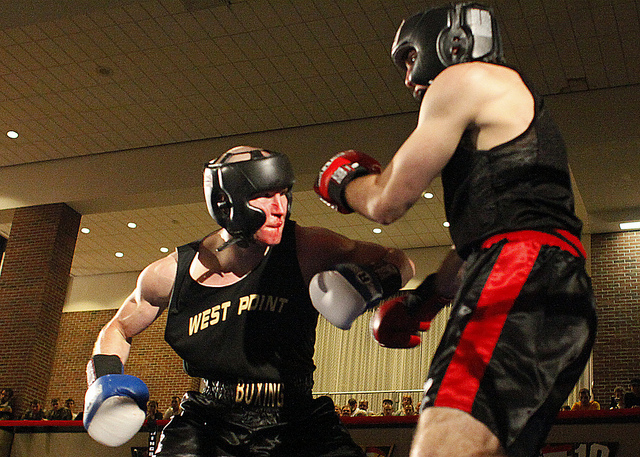 Drill it into your nervous system so when your eyes see the punch, your body reacts. To get a good visual of what you need to do, take a look at this fight between Mike Tyson and Larry Holmes. Holmes has a decent height advantage over Tyson and you will notice how Holmes attempts to pick Tyson off with jabs from the outside. He lets Tyson come to him (which works with Tyson's style anyways). Tyson explodes towards Holmes at every opportunity and attempts to stay there to unleash a few combinations. You will see how Holmes defends against this by tying up Tyson - even going as far as pinning/holding Tyson's arms under his own to nullify Tyson's ability to punch once he defeats Holmes' outer guard. This should give you a good idea of the kind of explosion required to get inside and the work it is going to take to stay there - especially against anyone who knows what to do with you when you do get there. Look at boxing a taller opponent as a new challenge that will force you to become a better all-round boxer. Pick the moment and explode inside. Once inside - stay there at all costs. Work once you are inside and don't stop. If you need a breather - clinch or explode back out. Be decisive - never hesitate when going in or out.